New Scientist has an interesting article on the ways in which it may make sense to talk about non-conscious entities creating meaning. Biosemiotics. 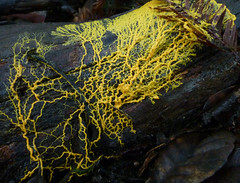 I had been thinking abut this when I came across a report on the slime mould’s ‘irrational’ decision-making process.It seems that like humans, Physarum polycephalum makes quick foraging decisions based on comparisons of what’s available. These decisions aren’t strictly rational. There’s a radio interview on CBS. This is a guest post by Meika, for which, many thanks. Cambridge-based researchers recently published a study providing experimental data which supports the idea that the human brain lives “on the edge of chaos”. Well, taking that ‘cognitive performance’ a bit more specifically to include learning, and learning to walk in particular, the following story leads in an interesting direction for us fourculture fans.